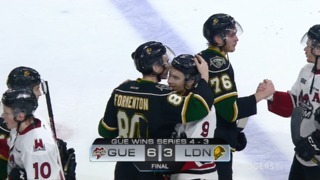 The London Knights began the busiest part of their 2018-19 schedule with a 6-3 victory over the Owen Sound Attack on Friday night at Budweiser Gardens. London is playing nine games in 15 days in six different cities between now and Feb. 22. Adam Boqvist led the way for London with a goal and two assists, and Alex Formenton scored a goal and added an assist in his return to the Knights lineup after rehabbing a leg injury that he suffered at Team Canada’s final World Junior selection camp. Formenton went 78 days between games with the Knights. Matvey Guskov and Connor McMichael also had a goal and an assist for London, and Kevin Hancock recorded two assists in what will be his first and only regular season game against his former team. The Knights ended the season series against the Attack with a 4-2 record. Owen Sound did manage to hold Liam Foudy off the scoresheet so his point streak was stopped at 13 games. That is tied for the sixth-longest streak in the Ontario Hockey League this season. 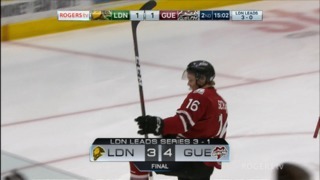 London received some help from the Mississauga Steelheads on Friday night. They beat the Ottawa 67’s 2-1 in a shootout, which means the Knights now trail Ottawa by three points for first overall in the OHL and London still has three games in hand. 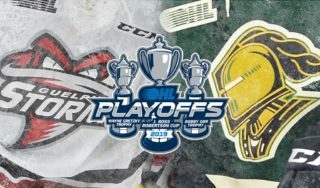 The Knights are at 8-0-1 in their past nine and will be in Saginaw, Mich., and Sault Ste. Marie, Ont., to close out the weekend. 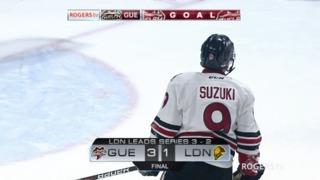 Maksim Sushko of the Attack was able to connect on a puck that was bouncing around in the London zone at 2:21 of the opening period, and he batted the equivalent of a floater serve past Joseph Raaymakers to make it 1-0 for Owen Sound. London forward Guskov grabbed a puck, made a nice move and was denied by Attack goalie Mack Guzda. Undeterred, Guskov picked off a puck again on one of his next shifts, made a move and fed a pass in front to McMichael, who made a gorgeous deke in tight to tie the game 1-1. The Knights scored a power-play goal with under two and a half minutes left in the first period as Evan Bouchard and Hancock combined to set up Boqvist for his 13th goal of the year, and London took a one-goal lead into the first intermission. Nathan Dunkley banged in a rebound off a Boqvist shot to put the Knights up 3-1 at 8:06 of the second period not long after Raaymakers had stopped Daylon Groulx on a breakaway. McMichael and Guskov combined again before the end of the second as McMichael got in across the Owen Sound blue line and dropped a pass to Guskov, who wired a shot into the Attack net for a 4-1 London lead through 40 minutes. Carter Robertson’s shot from the left point found its way through a crowd just 41 seconds into the third period and cut the Knights’ advantage to 4-2. Cade Robinson whittled the London lead down to one as he stripped a puck away and snapped a shot into the Knight net with just under eight minutes remaining in regulation time. Alec Regula restored London’s two-goal cushion as he banged home a rebound in front of the Attack goal on a power play and then Alex Formenton finished the scoring with his eighth of the year into an empty net at 19:41. By number of games, Formenton is 10 away from matching Hugo Leufvenius of the Sarnia Sting for longest point streak during the 2018-19 OHL season. By number of days, it’s no contest. Formenton’s power-play assist and then empty-netter to close out the win against the Owen Sound Attack gave the Senators prospect points in nine consecutive games over 79 days. Formenton stretched his streak to eight games by Dec. 8 and then suffered an injury while at Team Canada’s final selection camp for the World Junior Hockey Championship that kept him out of the lineup until Friday. The Knights head for Saginaw for the first time this season to play the Spirit on Saturday night. The teams have met only once, and London won the game 4-1. Counting Saturday, London and Saginaw have three games left against one another this year. Both teams are serious contenders in the Western Conference. Since their loss to the Knights, the Spirit have gone 8-2 and have closed the gap between themselves and the Soo Greyhounds for first place in the West Division. After playing in Saginaw, London will head for Sault Ste. Marie to face the Greyhounds on Sunday afternoon.